It was time to get out of the house… When my son Calvin turned nine recently, it was his first official birthday party that we didn’t host at our home. 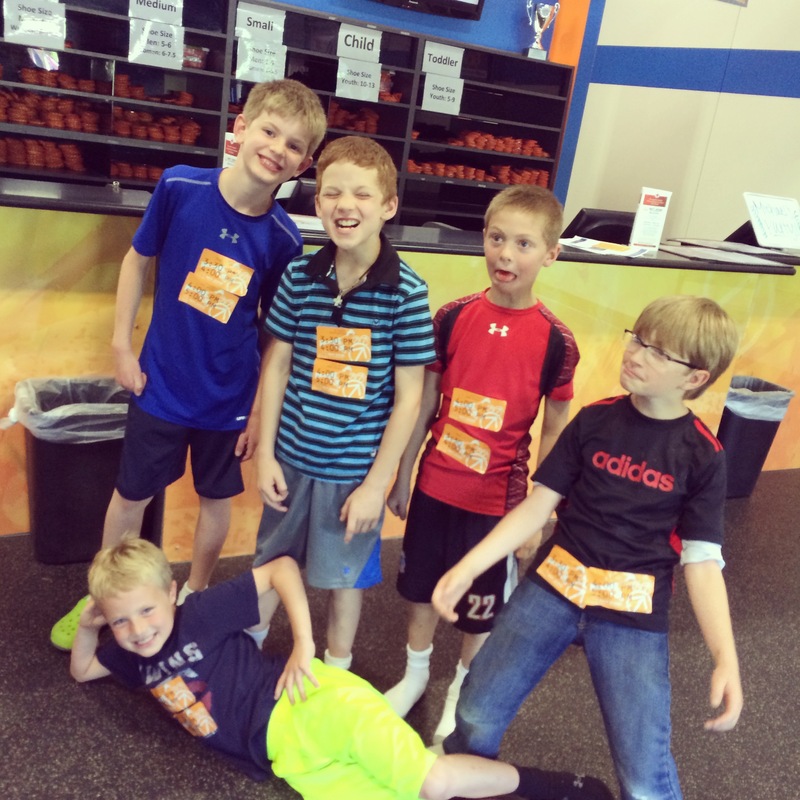 Months prior to his birthday, he began pushing for a Sky Zone Trampoline Park off-site party with his friends. Everyone was doing it. 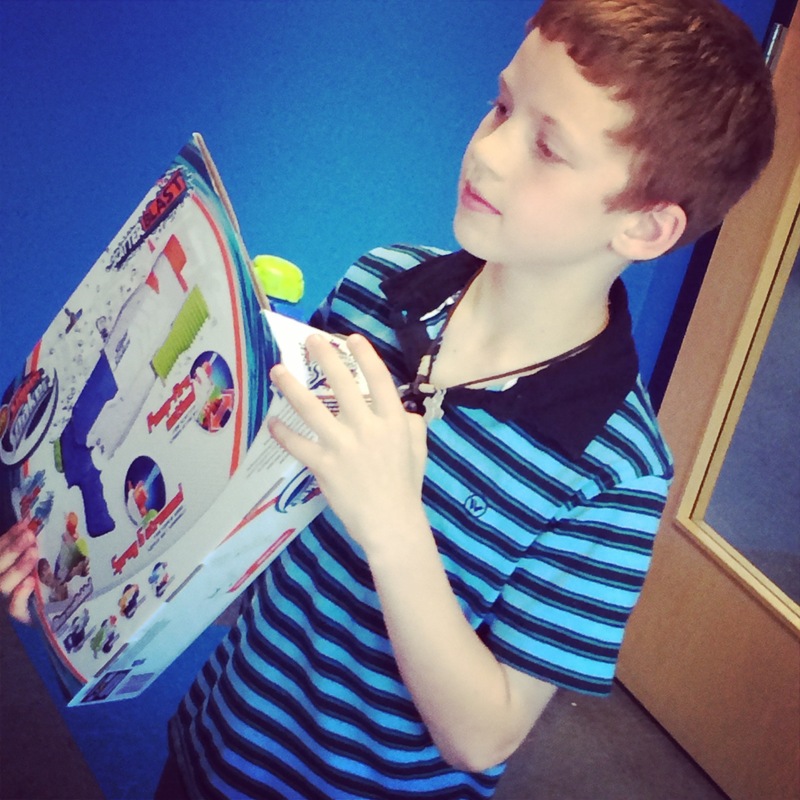 Calvin is highly persistent and stood over my shoulder one Sunday morning in April as we reviewed the Sky Zone website for party details and costs. There is a fair amount of information there, but you really do need to call to ask specific questions and check date and time availability. Calvin was standing by with my mobile. I made the call, narrowed in on a date (not realizing June 15 was Father’s Day — totally thought it was June 21), length of jump time and put down a deposit. I received a confirmation email, shared it with family and filed it away til early June. 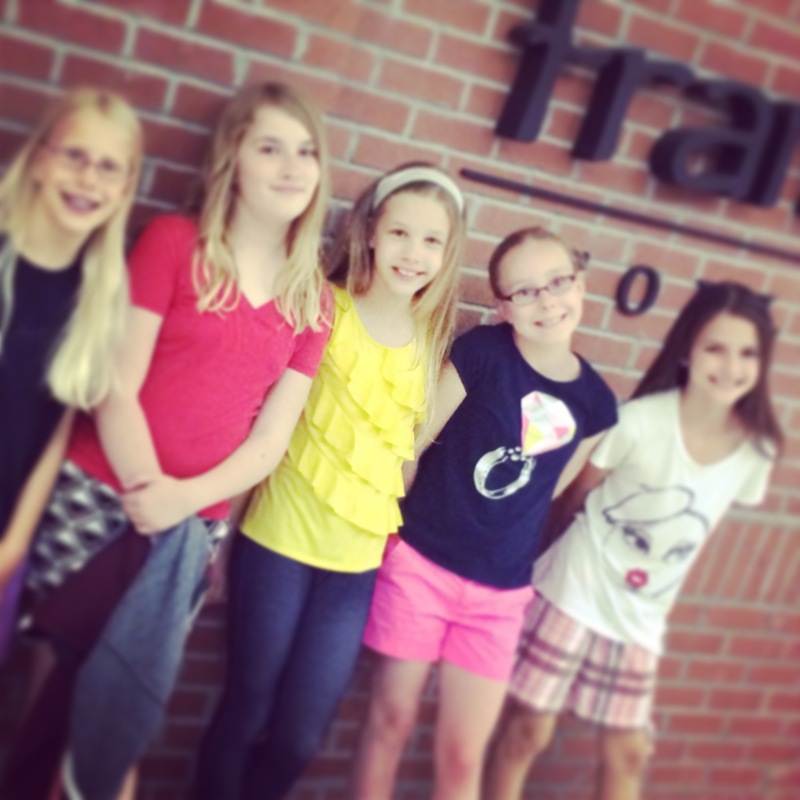 When early June rolled around, we relied on Evite again. One mom alerted me to the fact that our date selection was also Father’s Day. Not cool on my part! 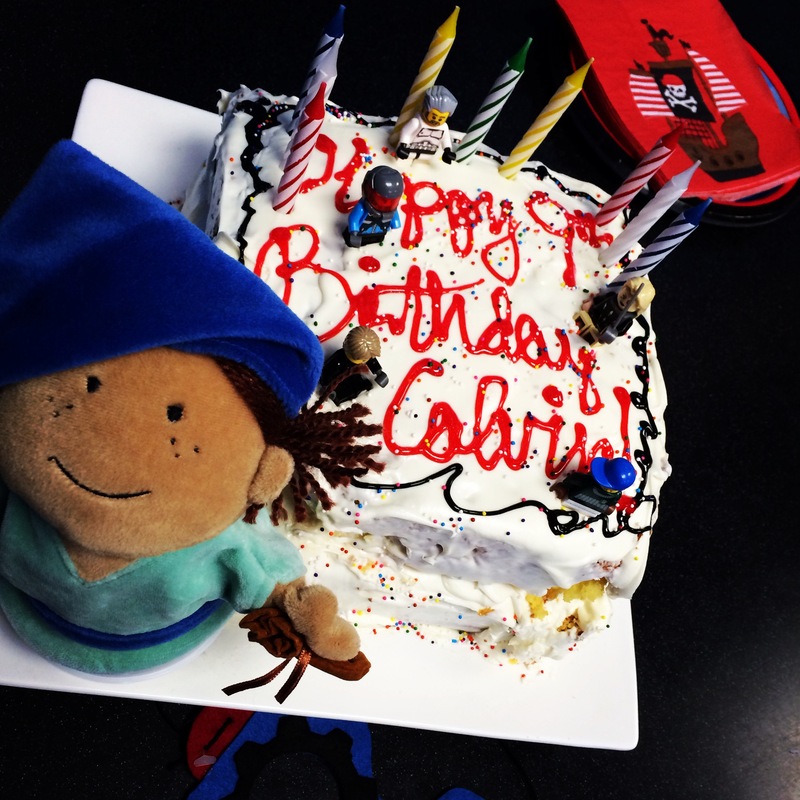 However, Calvin was born on the occasion nine years ago. I polled a few mom’s (and my husband) and they didn’t seem to mind, so we kept the date. At least no other kid birthday parties would coincide with his! The Sky Zone advisor I talked with upon booking recommended 1 hour of jump time. Calvin would not hear of it – – 1.5hrs was the minimum acceptable jump time in his book. So it was: 3:10 check-in, 3:30 jump time, 5:00 pizza time. 5:40 clear out. With five guest yeses about a week out, I started to think about offering to carpool the boys from Minneapolis (our home) to Plymouth (Sky Zone’s location), a 25 minute drive. All of the parents took me up on that one. It would mean 2:00p.m. arrival at our home and 6:30p.m. pick-up. I quickly realized that Calvin’s easy no-frills party would still be work. 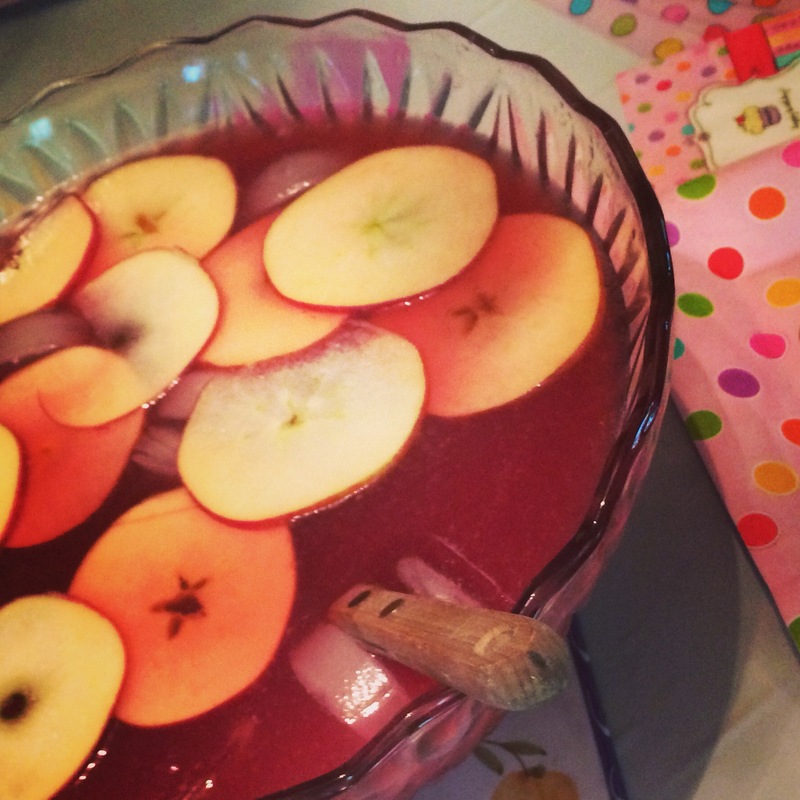 I started prepping the day-of the party at 10:00a.m. This included a run to Target, baking and decorating a two-tier cake, cleaning the house and packing up stuff to take to Sky Zone. All by 2:30. 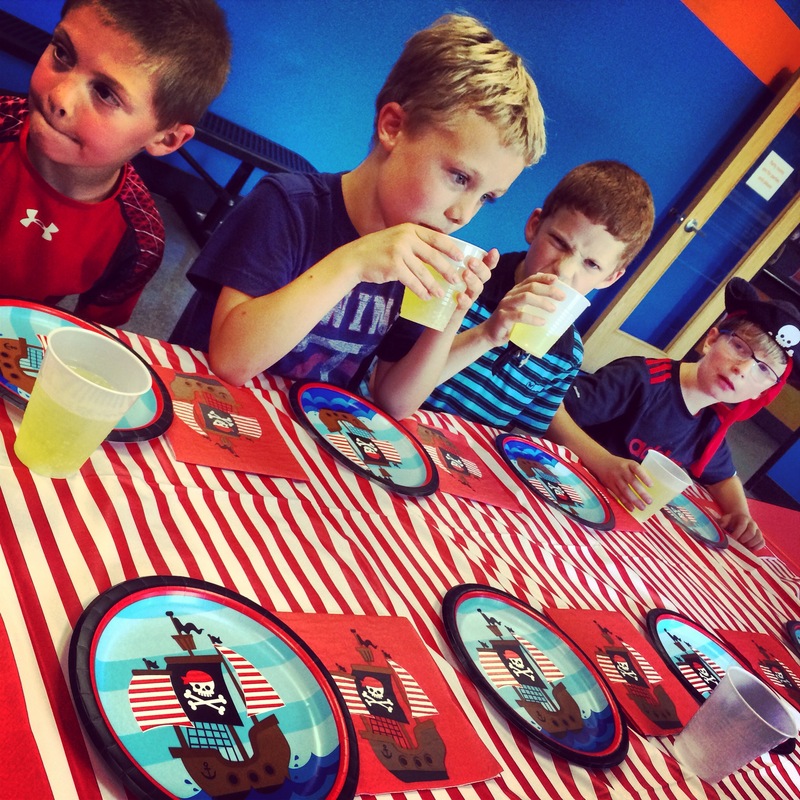 We went with a pirate theme, timely because his class had just finished their pirate lessons and party at school. Sky Zone contracts pizza out to Davanni’s. 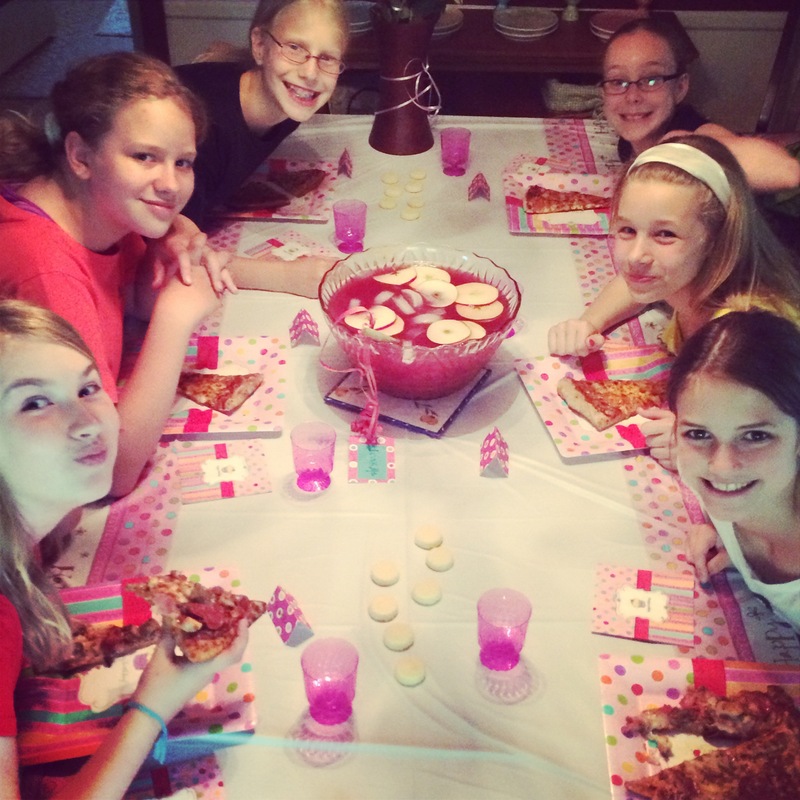 Part of our party plan meant we’d get one cheese and one pepperoni pizza for up to 10 kids for our $200 total amount. To order a sheet cake to be delivered as well, they need seven days notice. I opted to make ours and bring in ice cream too (guidelines state that you may bring in baked goods and pre-packaged ice-cream). The boys start arriving. Wow, they are loud! We have two carloads going up and the discussion is high-pitched and rotating between subjects of swearing, pants and grossness. 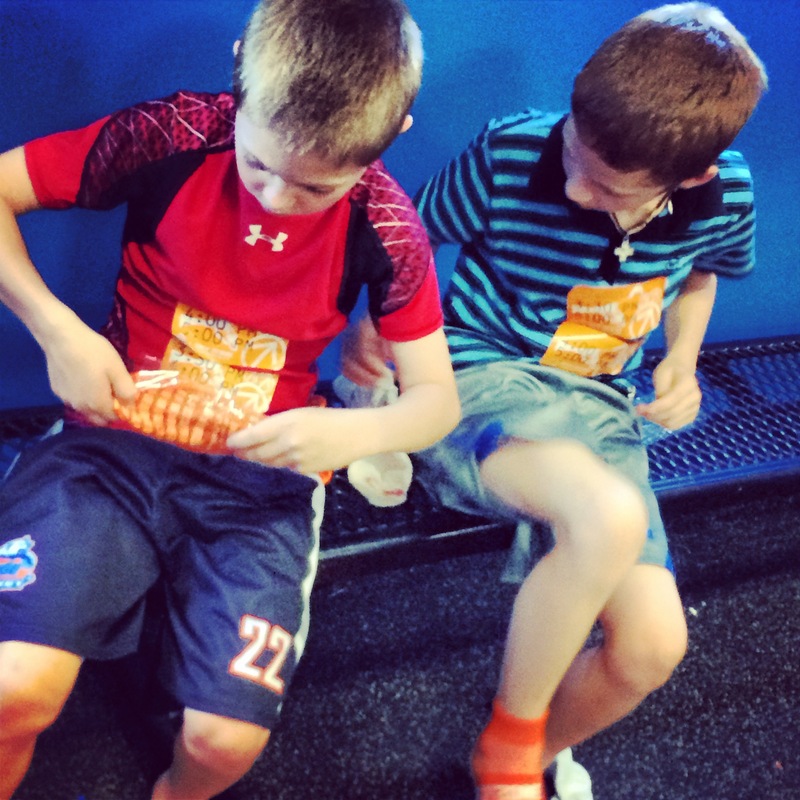 We check in at Sky Zone where bright orange gripper socks and water during jump time are all inclusive. The party host, Austin, runs all of the waivers through (I emailed requests to parents ahead of time so they could fill out their child’s form online). There is some confusion if the online submission totally covers them, or if kids needed to also print it out and bring it with them. I’m still confused. The boys, stickered with their 2 jump time segments (3:30-4:00 and 4:00-5:00), burst in to the zone. I wondered if 1.5 hours would seem like an eternity. In most people’s opinion, an hour is plenty. Nine-year old boys are not most people. The norm doesn’t apply. 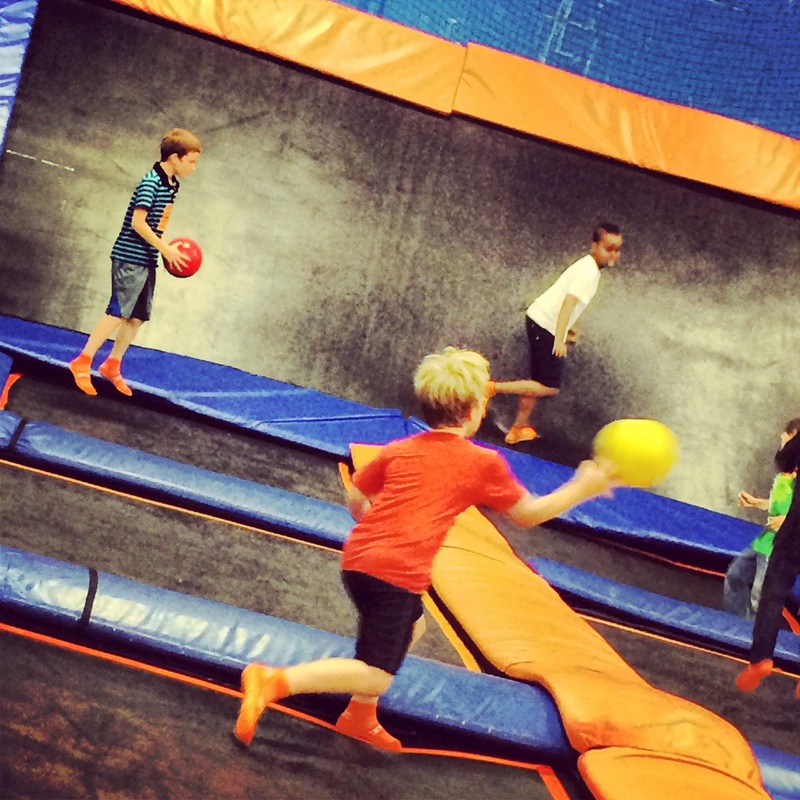 They went from trampoline mosh pit to dodgeball and back to sky high jumps. After the boys were jumping for 30 minutes, I decided to brave it and join my daughter, Ava, and her cousin, Ravelle. After all, we did pay for a block of up to 10 jumpers. There were 9 of us. I wasn’t prepared for the high fun-factor and height these trampolines afforded, not to mention the workout and soreness days later even after a 10 and 20 minute segment. Picture Lego man jumping jacks from the LEGO Movie. At promptly 5:00, it was time for the party room. The party host helped with set-up and had our beverages ready and pizzas on the way. Did the boys not expend any energy? They still seemed crazed to me. The girls and I hung tight together in the corner. What happened to the sweet little eight-year-old boys that had manners? Ava informed me that this was a new phase. Super Soaker = Great Gift! Post pizza, there was cake. Roughly, one could discern a pirate Lego theme (I made use of our numerous Lego figurines for this). One small section of the cake had literally fallen off at home, most likely because I baked a 9×13″ pan’s worth of batter in an 8×8″ square pan. I improvised with a pirate puppet to cover the mishap. 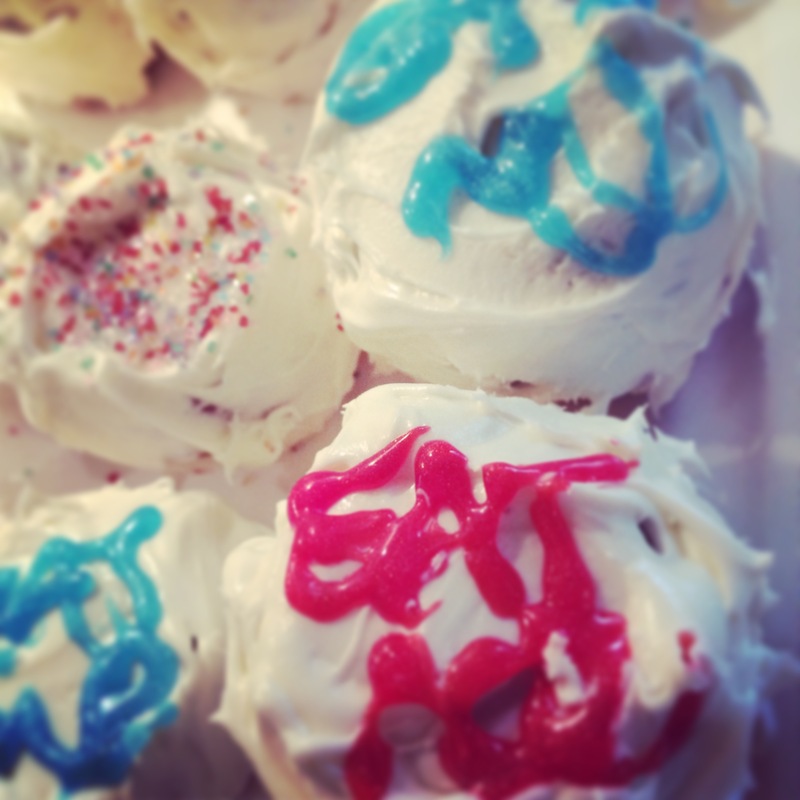 It still tasted delish. The boys were amped up and it was time for gifts. How can you go wrong with footballs, ropies and squirtguns? After more pants talk and pull-down attempts, we tidied up our party room and checked out at 5:38. They do run a tight ship there. I thought it was the perfect amount of time. Somehow my husband got Ava and Calvin in his car and I had the four boys in mine. That was a long drive home. When I arrived and pulled up behind them, Ava inquired, “Mom, are you okay?” Ahh, she’s so sympathetic! Calvin and friends immediately tore into the gifts, launching the ropie into the tallest tree on the block. Finally, the parents arrived and chorralled their boys into their cars. By 6:45p.m., it was silent. Time to move right into Father’s Day!